One of my favorite features on Reduce Footprints is our monthly vegan recipe. Meatless meals are good for the planet and good for our health. And ... it's a terrific opportunity to meet talented chefs who whip up delicious dishes to tempt our taste buds. This month's Guest Chef is, indeed, very talented! Please meet Sam, author (and head chef) of The Quantum Vegan. The Quantum Vegan is a wonderful blog with a variety of interesting posts ... interviews with authors and chefs, product and restaurant reviews and even discussions on eating disorders. And then there are recipes ... lots of recipes ... lots of delicious recipes ... things like “Cheesy” Sweet Potato Hash Browns for breakfast, Toasted Zucchini-Cabbage Sandwiches for lunch and, one of my personal favorites, Millet Salsa Bowls for dinner. Looking for a desert recipe? How does a Mocha Brownie Torte sound? Or maybe “Dandy” Chocolate Chip Walnut Bars? Maybe you're just in the mood for a snack and would find Tangy Shredded Salad to your taste ... or Garlic-Dill White Bean Hummus. Is your mouth watering? Mine is! Each recipe is clear and concise and includes ingredients which most of us have in our kitchens. More importantly, each recipe (at least the ones I've tried) are fabulous ... they meet my main criteria: 1) they are easy to put together and 2) they taste great. The Quantum Vegan is for anyone who loves good food. I hope you'll check it out! Sam has graciously agreed to share a recipe with us. It looks delicious! After seeing Forks Over Knives, I was inspired to start swapping out the vegan convenience foods in my diet with more whole foods. Without frozen burritos or ready-in-4-minutes organic ramen to rely on, I had to start being more creative about lunch. It was time to seek out new recipes! 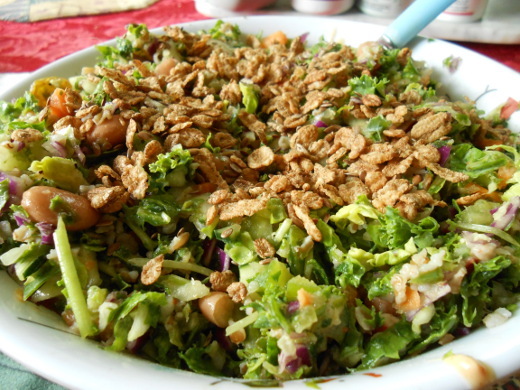 Inspired by the "Hugh Jass Salad" in the Peas & Thank You cookbook (we won't mention how long it took me to work out that joke), I started making big salads with lots of add-ins, which evolved into big chopped salads with crunchy toppings and improvised "dressings." 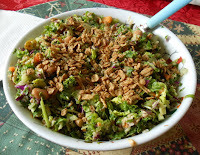 Chopped salad is a great way to get in a lot of vegetables at once, plus the chopping mixes everything together so you get a little bit of each flavor in every bite. Add some grains and beans, and you've got a whole meal in one bowl! Another bonus is that it's extremely portable, so if you're in need of a healthy lunch on the go, you can't go wrong with a big honkin' salad. This is my basic recipe, but you can mix and match depending on what you have on hand. Sometimes I swap out some of the summer squashes for a few brussels sprouts or throw in some pea shoots. Quinoa and chickpeas is my favorite grain/bean combo, but I've used red rice and pinto beans, millet and white beans and bulgur and kidney beans in the past. Uncle Sam cereal is my favorite topping since it's just wheat flakes and flax seeds, but you can use anything healthy and crunchy. Chopped walnuts come to mind! 1) Dump the greens, kale, cabbage, squashes, peppers, carrots and cucumbers into a food processor. Pulse until chopped but not mushy. Transfer to a big salad bowl. 2) Add the grains and beans. Drizzle on the hummus "dressing" and mix until well combined. 3) Sprinkle on the pepper and Uncle Sam cereal, grab a fork, and enjoy! Sam, a.k.a. the Quantum Vegan, has been vegan for three years and has spent that time experimenting with recipes in a quest to discover as much delicious vegan food as possible. She loves sharing pictures and comments via the Quantum Vegan blog and finding new recipes from other amazing vegan bloggers around the web! MMM ... I can't wait to try out that recipe! Thanks, so much, to Sam for stopping by today and sharing this dish with us!